In July 1944, the 69 year old German merchant and amateur archaeologist, Waldemar Julsrud, took a ride on his horse along the base of the Hill “El Toro” (the Bull) at Acámbaro in Mexico. Suddenly, he saw half buried under the mud, some ceramic figurines. 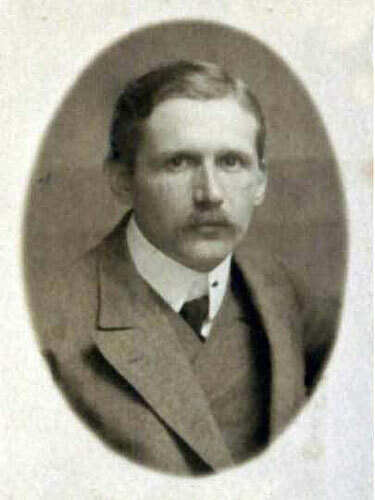 His interest was piqued immediately, because some years before he had made an archaeological discovery 7 miles away from this area. To the delight of the whole archaeological world a collection of ceramics was then uncovered. It was attributed to a still unknown Indian tribe thousands of years old. Until today this collection is known as the Chupicuaro collection. Julsrud asked a local farmer to help him with the digging. For each figurine the farmer delivered, he got paid one peso. The farmer needed no further encouragement, and in the following 7 years no less than 30,000 figurines were found! They all emerged from shallow pits, uncovered under the watchful eye of Julsrud at the base of the Hill. 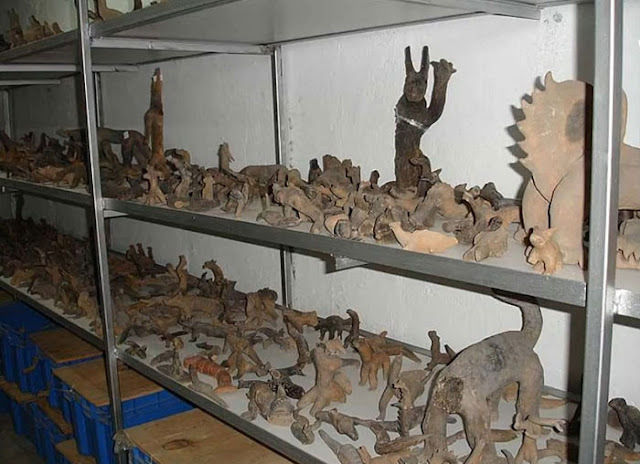 Each pit contained about 30-40 statuettes. They were not tomb gifts, because graves were not found there. Hand crafting by recent residents of Acámbaro had to be excluded too, because this place did not know any pottery tradition. 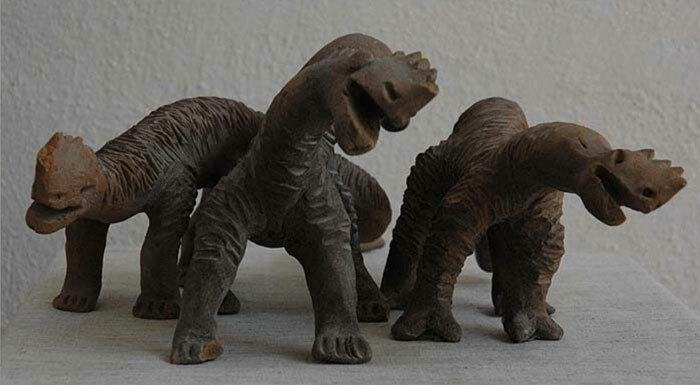 Julsrud was amazed because the creations showed not only human figurines like the Chupicuaro collection, but also monsters, dozens of recognizable dinosaurs, people together with dinosaurs, and even flying saucers! To me they look exactly like Dinosaurs how about you guys? These just shouldn’t exist but yet here they are! They ARE REAL and have been carbon dated to 3,000 to 7,000 years old! That means history has to change! The timelines MUST CHANGE! Despite the huge number of figurines, they were all different. 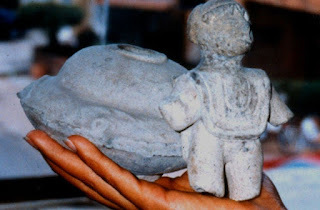 It was discovered that they were composed of different kinds of clay, including black clay from Oaxaca. Oaxaca, however, is more than 500 miles away from Acámbaro. Julsrud never sold any of the figurines. Just like he did with the Chupicuaro collection, with great enthusiasm, Julsrud invited the archaeological world to come and take a look here as well. But as soon as they found out how bizarre some images looked, the discovery was dismissed as a hoax, again here’s the scientific world only believing in what it wants to? Just look at all this evidence which is been ignored by science even though it’s all been carbon dated and is real. The establishment stinks. If it doesn’t fit in with their views then it’s completely ignored which is a crime against humanity in my views? Such people did not prevent Julsrud and his followers from investigating the suspected age of the discoveries. 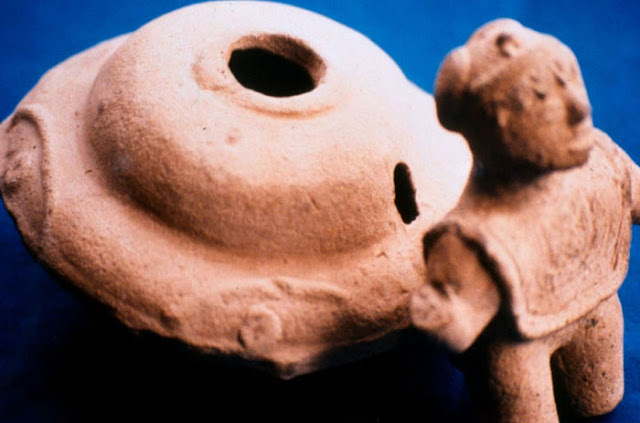 And they were right: the figurines were authentic and the age was determined by the Isotopes Inc. company in New Jersey (by radio carbon dating) as well as the University of Pennsylvania (by TL-dating) to be in a range between 3,000 to 7,000 years old. But, as usual with artifacts that don’t fit into the prevailing historiography, the establishment continued to stubbornly ignore the existence of the figurines. Since 2001 a large part of the Waldemar Julsrud Collection can be viewed in the Waldemar Julsrud Museum, the former home of Julsrud in Acámbaro. The Dinosaurs in the images are real it’s been proven. Of course there was speculation about how it was possible that people from that time could portray dinosaurs. 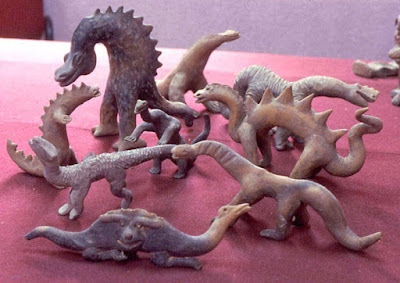 Some thought that there might still have been real wandering dinosaurs in Mexico 5,000 years ago. Others believed that the first people of that Indian tribe might have descended from the time of the dinosaurs (more than 65 million years ago). However, if you consider that the people in the figures were probably not earthlings, but extraterrestrial visitors , other explanations are more obvious. To the right is what appears to be an Alien with a UFO spaceship of some sort? Then the images don’t necessarily depict themselves doing things on Earth, it may also have been on other planets, where dinosaurs are still living. Besides, space traveling for highly developed civilizations goes through the fourth dimension, also called hyperspace. This allows for time traveling as well, because linear time only exists in the third dimension. From a higher dimension you are able to ‘slip in’ at any time on our time line. These extraterrestrial visitors could easily have made trips from their base camp in 3,000 BC, to other eras, such as the time of the dinosaurs. 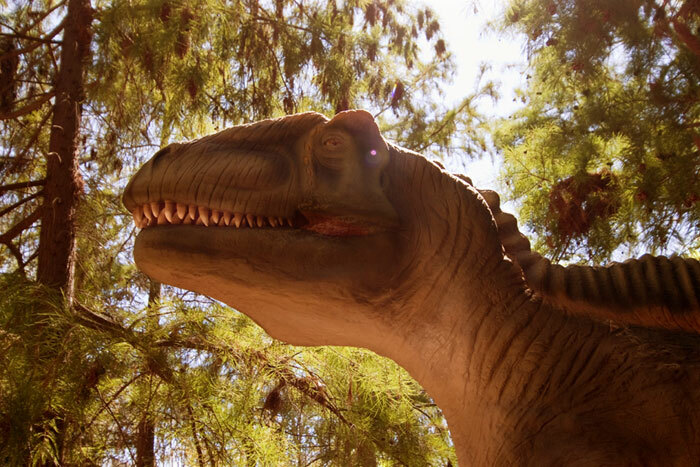 Since some negative alien races, such as the reptilians and the Anunnaki are born fighters, these prehistoric monsters undoubtedly formed a great challenge to hunt! So there you go, tons of intelligent food for thought? If this was based on a myth or just a story then I don’t think UFO Sightings Footage would be that interested because lets face it, everyone has a good yarn, but this is based on PROOF! It’s based on carbon dating, pottery, figurines and not just one or two but many tens of thousands! To depict Dinosaurs and what look like UFOs from ancient times means only one thing, it means they witnessed them. It means everything you’ve learned at school, college, university all needs to be revised and the scientists need to stop ignoring the proof which THEY carbon dated, they need to see whats up and change the official human history timelines now! I don’t know about you but this whole event screams cover up?